A friend and I were out to dinner last week at the lovely neighbourhood bistro, La Piola. The food was quite good, the service was well-meaning if not exactly efficient, and a good time was had by all. But it got me thinking (again) about the exotification (I’ve decided it is a word 🙂 ) of food; how some foods begin to have reputation for being the best, however that might be defined, and a premium is charged, paid, and an elite fetishism begins. Victoria has a pretty significant foodie scene for a city of it’s size. It’s a city with a lot of money and wealth circulating (look at the average house prices!) , and that gets combined with the environmentalist vibe that pays attention to carbon footprint and food security issues (especially given that we live on an island). This has led to a strong local food movement, something I am all in favour of. There are a growing number of small restaurants that are focusing on fresh, local ingredients, and there are also a growing number of local food growers and food processors that are making those ingredients available to the public. Some of those foods have gathered that foodie following that makes them highly prized status items. A couple of cases in point: Fairburn Farm Mozzerella di Bufala and Venturi-Schulze Balsamic Vinegar. Incidentally, both of these producers are located just down the road from us–do we live in the best place or what?! The mozzarella from Fairburn is legendary. The family who runs the farm was trying to import Canada’s only herd of water buffalo when the “mad cow” crisis hit. They got lots of publicity for their challenges as they struggled to hold on to their dream and business. They were successful in overcoming the obstacles, and now they produce water buffalo milk that a highly regarded small cheesemaker in Courtenay turns into reputably beautiful–certainly hard to come by–cheese. The balsamic vinegar is even more prized. Venturi-Schulze is one of the original winemaking families on the island, and their reputation for attention to detail, craft, and hygiene is well-deserved. Their wines have long been available by subscription in small amounts, and much of the wine and vinegar has never really made it to the public–it was bought up too quickly by restaurants and others in the know. They are evidently producing enough vinegar now that I have seen a few bottles for sale here and there in stores. Prices start at $49 for 750 mls. I have made it a habit to try these and other hard-to-find delicacies whenever the opportunity arises. Though I’ve been a vegetarian (ok, a “pescaterian”) for almost 20 years, I’ve been known to taste rabbit, duck, pate, foie gras, and other rare treats when out with others, simply to see if I’m missing anything amazing! Most of the time, though, I find that I’m not. So out for dinner the other night, my friend and I decided to share the Caprese Salad. It advertised fresh heritage tomatoes (hothouse, of course, right now), Mozzarella di Bufala, and Venturi-Shulze balsamic vinegar. How divine! But what I found was that in fact, the taste didn’t live up to the hype. I don’t know if it’s because hot house tomatoes just really don’t have anything on fresh tomatoes in the middle of summer, or because the whole thing really needed a sprinkle of salt, or because I’m getting so used to the freshest ingredients that we pull out of the garden and ocean ourselves that I’m getting spoiled, but I found the whole salad good, but not great. The bread from the bakery next door was fine too–a cut above the supermarket for sure–but it has nothing on our daily bread from True Grain where the reputation and product do match well. So I keep trying. But more often than not these days, I seem to realize that beyond any claims of “authenticity” “tradition” “care” price or other kind of hype, the only criteria that seems to really make the difference between good, better, and best, is quality technique (skill?) and freshness. And that, fortunately for us on Vancouver Island, is becoming less and less elite and inaccessible. And I think that’s also the issue that keeps bringing me back: good food should not be an elite, high-class, expensive option. Here in North America, these prized foods are fetishized, but in European traditional culture (more on the nostalgia for that here another time!) these are the foods of the people–the least commodified products of all. The Skipper grew up with little money in a hamlet on Nova Scotia’s Eastern Shore; what did they eat? Lobster, of course. 🙂 But I guess, as much as I have a sense of mission to make the best available to all, I also recognize that it is human nature to create status symbols to differentiate power levels, and that anything rare will continue to be used in that way. Somehow I suspect I’m not done exploring these issues! Dumpster Diving: Food Foraging 2.0? Food has a long and complex relationship to economies. As long as there has been trade, food products–spices, dried exotic fruits, teas, salt–have been valued commodities. And yet through most of human history, food commodities have been supplemental luxuries, and the idea that money or another means of exchange would be necessary to provide this essential element would have been inconceivable. We think of “hunter-gatherer” societies as something ancient and distinct from the agricultural societies that we’re a part of now. But the reality is that hunting and gathering have never disappeared. Even today, in the most industrialized food systems, there are rituals that remain. Here on the coast, the invasive, rapacious Himalayan blackberry draws people to roadsides and railway tracks every September for its inky, juicy berries, and recreational fishing abounds. The urban deer population is exploding, yet apparently deer sausage and salami are surprising tasty :). In a recent class, my students were discussing a book excerpt by Lars Eighner, “On Dumpster Diving”. It’s a well-written account of what being homeless and scavenging for food and all of life’s necessities in trash cans is like. A common question I ask as a follow-up is, “are there circumstances under which you could see yourself dumpster diving?” A mature student in this class had an interesting response: there is so much food around us that is easily accessible on the Island that he would gather food that way before looking in trash cans. In that moment, I was struck again by the surreal nature of the current urban human condition. How many of us, if made homeless tomorrow, would think of the woods or local parks as the safe provider of food and shelter? (Ok, besides Timothy Taylor) Many of us wouldn’t even recognize the food in front of us in the berries, leaves, roots, mushrooms, animals, and insects abounding. (*) This disconnected relationship from the ecosystem that we’re a part of is bad enough, but the flip side seems even worse to me: that what we are capable of living off of–in reasonable comfort if Eighner and the Freegans are to be believed–is the “trash”, the waste of the industrialized consumer world. Freegans are clear that they are the new foragers; the return of the “gatherer” without the “hunter”. While we know that our urban trash food might be dangerous in a few discernible ways, we feel at a complete loss to identify the potential dangers of wild foods–which are the poisonous berries and mushrooms, are those the icky bugs really edible, how to trap, kill, and cook a whole animal (#)–it’s enough to stop most of us. Which brings me to the newest way that food and the economy are interacting, and perhaps the newest symptom of food dysfunction: wild food–free by definition–as exclusive and exotic commodity. I would love to learn more about wild foods and food foraging. I am an 85% urbanite by training (I do remember picking wild asparagus by the roadsides in the Okanagan; as children we were dressed in winter clothes in the heat of September and sent without machetes into the blackberry forests of the lower mainland to gather berries; I still munch on huckleberries and salmonberries along hiking trails, but I’ve only recently confirmed that the ubiquitous salal berries are, in fact, edible). I am intrigued but vaguely frightened of the trial and error method of finding edibles in the local woods. There are myriad book and website instruction guides out there, but this is one area where I’m not sure it’s best to learn from books. So that leaves me with 2 options locally. Option 1: Buy wild foods. Entrepreneurial locals are doing the foraging for us, and making a living (?) from their now-so-exclusive knowledge. Option 2: Pay a foraging guide. Gourmet chefs and foodies are willing to show you the ropes…for the price of a high-end restaurant meal (which, if truth be known, I have willingly shelled out for from time to time 🙂 ). I don’t have a problem with either of these as a business model, and I know, in theory, that other options to learn exist; I’m sure if I networked enough I could find someone willing to help. But the exotification (is that a word?) of what should be the most freely accessible local food is making me cranky; perhaps precisely because I feel the disappearance of that local knowledge in a personal way. The conception of wild foods as elite foods is just wrong. I should mention, too, that the “disappearance” of this knowledge is also a reflection of the colonial machine. The only reason non-indigenous Canadians like me had this knowledge at all is because it was shared by the people who had been living off this land for thousands of years. The fragility of local knowledge is also a symptom of global mobility, and the disruption of the relationship between culture and place. It’s entirely likely that my Scottish ancestors knew well how to live off their lands; it’s the fact that they left them that leads to my position here today for better and for worse. Contemporary First Nations communities may not be losing their indigenous plant and food knowledge; I don’t know. But rather than learning more from them about the place we inhabit, we’ve chosen to import our knowledge from elsewhere and build up imposed industrial cycles. I’m highly aware that if those industrialized systems ever truly break down, we’re really in trouble. Not only do we not know how to live off the actual land and its plants around us, but the landscape is now so degraded and altered that there may come a point where the indigenous knowledge becomes of more limited value. What’s point of knowing how to smoke and naturally preserve a salmon if there are no more salmon? Maybe we are better off in the dumpsters after all. (*) First Nations people were apparently mystified when they discovered the early European explorers dying of scurvy while in the middle of conifer forests that were essentially one big vitamin C store! In organic gardening circles these days, on the cutting-edge fringes of the sustainability movement, the principle focus is on how humans can get what they need (food, shelter, water, etc) from nature by intervening (ie screwing things up) as little as possible. There is a growing recognition, for instance, that either leaving natural cycles alone, or finding ways to stimulate or imitate them, results in better yields, less damage, and perhaps most importantly, less human labour required. These are some of the key values behind permaculture (about which I’ll write a lot more), no-dig /no-till/lasagne gardening, and companion planting, just to name a few movements steadily gaining popularity. Gardening itself is an intervention into natural cycles, of course, and it’s debatable whether human communities have ever not manipulated nature to serve their needs. In fact, we often forget that we are not outsiders to nature who have an unfortunate and inherently destructive impact. We are inextricable members of the eco-systems we inhabit, and like other creatures, our actions benefit some species and consume/destroy others, with nature always striving for life, biodiversity, and balance. I’m convinced that part of my (our) learning curve is patience and observation (also one of the first principles of permaculture). When we begin with observation, we learn to better understand the cycles of our backyard ecosystems, their members and inhabitants, and hopefully become able to intervene lightly, if at all, in order to meet our human needs. This process recently became very real. We have a big area at the back of our garden that was a weed patch and home to the burn bin. It’s a big, full-sun space close to the compost pile that the Skipper decided way back would make an excellent potato patch. It’s been cleared, manured, topsoiled, and covered with some landscape fabric just to keep the weeds down while we waited to plant. Last weekend, we pulled back the fabric and at the wooden edges of the bed out spilled a gazillion wee ants! They streamed like… well, an ant colony unexpectedly exposed to the light and startled by us giant observers. We watched, fascinated, for a few moments as they rushed about in a panic, and then we wondered what to do. Skipper went to the greenhouse where we had inherited a variety of bug chemicals that we had never intended to use. He brought out the one for ants, read through the ingredients and warnings. It said it would harm bees. We didn’t like that. We wondered what kind of ants these were and what they might be doing. To the internet! I did some research and discovered that these were likely the dreaded carpenter ants, the ones that eat wood and destroy houses. Oh no! After poking about the bed a little more, Skipper came in with some bad news. The bed is ringed/ terraced with some old stumps. When he poked a stick around the stumps, he found….TERMITES!!! Panic stations! So what did we do about these buggies in the end? Nothing. Termites and carpenter ants live naturally in our landscape. There is no such thing as getting rid of them. They arrived because of our hospitable conditions: rotting wooden stumps and non-treated wooden edging. We can’t take the wood out without losing the bed, which at the moment, planting-time, doesn’t make sense. Although termites and ants can damage crops, they are unlikely to at this point because of the ample food supply in the stumps. The ants might eat up all the termites, and then move on to find another food supply. The nests are both FAR away from the house, and pose no real harm to us at this point. The ants are probably a yummy food supply for the birds and other critters about the yard. “Solutions” like ant and termite poisons–even mild ones like boric acid–aren’t great for the ant/termite predators, ants and termites are part of the bee family (who knew?! ), and we are trying to protect the bees. And who wants poisons next to potatoes? In the fall/winter we might think again about getting rid of the stumps, or sending some boiling water down the nests. But for now, we live in peace. And I must say, doing nothing certainly took less time and effort! The Second Annual Cowichan Bay Spot Prawn Festival started on Saturday. We had intended to walk down into the village to enjoy the festivities, but got too caught up in our work in the garden and the sunshine. This evening we headed down to our prawn and crab traps, and after a little sail in a light wind, we hauled them up…. after being skunked for weeks, we pulled up 4 big prawns! Time for our own celebration! When we got home, I debated about how to cook them–stretch them with other ingredients on hand into a Thai curry? Or just saute them in butter and eat them out of the pan on their own? The Skipper and chief trap hauler voted for something simple. So into the hot pan went some garlic and butter. Then I remembered that earlier in the day I had harvested the 1 asparagus spear that had appeared in the strawberries. That got chopped up and added to the pan, and our Mini Meal was born. I raced out to the garden with a bowl and my scissors, and quickly harvested a couple of handfuls of baby spinach, arugula, pea shoots, a small volunteer lettuce head recently revealed under a cold frame we moved, some chives and blossoms, and a few leaves of pineapple mint. Yum! They got washed and dressed with a bit of lemon juice, olive oil, salt and pepper. 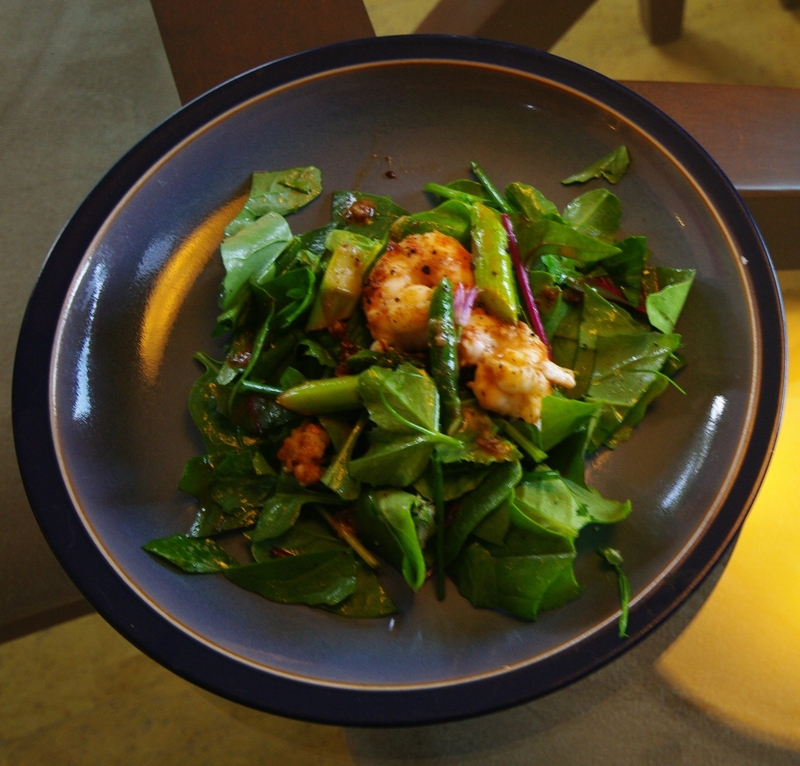 I divided them up between 2 small plates, and topped them with the warm prawns and asparagus–2 each!–and spatula-ed the garlic butter over the lot. It was a Mini Meal, though, so we supplemented with some not-so-local toasted sourdough, brie, and avocado, with pineapple for desert. 🙂 Accompanied with some almost-in-our-backyard Merridale Cider, though! Here’s to our first garden salad! When I look over the garden each day, I am filled with joy. Everything looks green and lush, the peas are coming up nicely, there is a mature perennial bed that seems to grow inches every day, the sun is shining, the birds are singing and nesting…it feels like paradise. But there are details here and there that are worrying. I noticed several weeks ago that the apple trees didn’t seem to be blooming right; the flowers didn’t seem to be opening fully and the leaves seemed curled up. Some buds were turning brown before even opening. After some research, I discovered that this was the common wet climate pest, powdery mildew. Aack! I’ve got some organic spray to use, and I’ve been waiting for a wind-less, rain-less day ever since to apply it. Powdery mildew won’t kill the tree, and it is a regular issue in these parts. But as the apples really leaf out, I’m thinking we won’t get a lot of fruit this year. I can’t imagine that enough flowers opened fully enough and went through their pollination and other life cycles to get the kind of crop we got last year. But that might be ok. We’re learning! Next time I’ll start spraying earlier. I’ve got roses with black spot and some yellow leaves, and I think I am going to get the iron chelate foliar spray for the raspberries. And did I mention the weeds?! A future post of their own….Time to step back and admire the big picture a little more, I think! The temperatures are finally warming up around here (hurray! ), and our focus is turning more fully to getting the garden up and running. This is our first big food garden, and I’m so excited! It’s also our first full year cycle in the Cowichan Valley, though, so we’ve been learning about frost dates (later than I would like) and night-time temperatures (too cold!) and when to start planting everything. Although I’ve bought a few herb seedlings from the local nursery, all the veggies are being started from seed–also a new experience. Seeds take a long time to sprout! Overwintering Veggies Rock! While the peas I started in February and March are getting bigger now, finally, I now see how slowly even cold weather crops grow in late winter/early spring. My overwintered fava beans, though, are HUGE and flowering nicely, and we’ve had a giant cauliflower that we’ve been eating away at for a month. My overwintered broccoli, brussel sprouts and cabbage bolted early (too warm under the cold frames? Not enough water? ), but we still loved eating the shoots, buds, leaves, and even flowers. All of that from a few late seedlings that I took a chance on just after we moved in as the fall was starting. Clearly, overwintering is the secret to eating out of the garden almost year-round. I’m planning a big winter garden this time! We’re on a steep learning curve and loving it, but some niggling questions remain unanswered: anyone out there know why the edges of many of our plants’ leaves are turning yellow? Raspberries, the male kiwi, some roses, and this morning I noticed one of the lemon balms…The raspberries look like iron deficiency, so I added compost (the internet says that organic matter helps the plants to absorb the iron that’s in the soil–if it’s on the net it must be true, right?!). Some vigorous growth, but still lots of yellow. Lime? Water? Time? Thoughts? Help? Please?